Here we are at day 4 of the January Whimsy release! All new products are already available for purchase HERE. 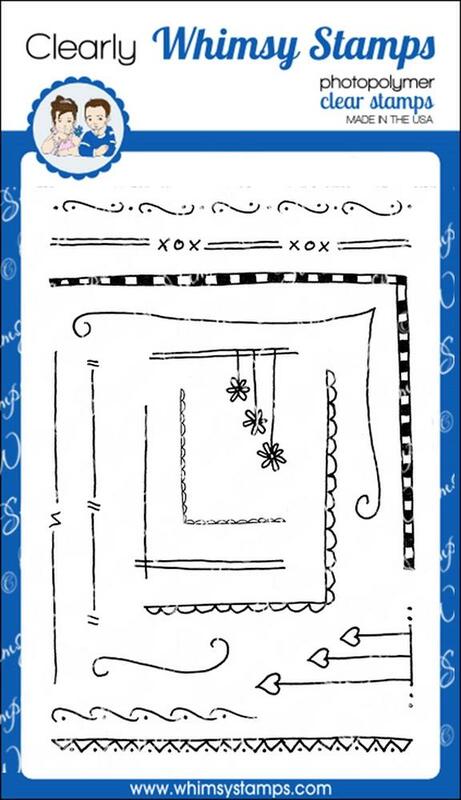 Today I am showing you Fadoodles Too, a really cute border-making type stamp set. I used it in conjunction with this month's CAS set, Shamrock Swirl. I stamped the checkered border corner twice on a white base to create a complete frame, then added one stamp of the curly corner. I white-embossed the scalloped corner on a lime panel and fussy cut it out. I added the sentiment and two small shamrocks to that piece. I stamped, cut out and popped up the shamrock in the middle. Then I popped up the lime piece on the card base and added some rhinestone sequins.